and |B| from 3 to 5nT, dips below 2nT at 1hr. complex fields and plasma characteristics. 94164  0600	94166  1700	SBC		8	From 0 to 180 Degree, interrupted by mple. 95028  1800     95030  1000     IR              W       From LSS to HSS with ram and magnetic PCs, SBCs. field increase, with B aligned N, and accompanied by strong EyC. DOY 150 bw. 200 and 1030hs. the GSM South direction, for more click here. at period end. A IACG event!. 95301  0300     95301  2000	BzN		W/8	B field peaks near 1200UT above 7nT. 95328  0600	95331  1100	LSS		W & W/8	Period ending with about 24 hs of a 10 Deg. 96001  0900	96004  1200	SBC		W	Period with multiple SBCs, from 0 to 180 Degs. 96024  2010	96026  2330	SBC		W/8	Period with multiple SBCs from 180 to 0 Degs. plasma while multiple SBC from 120 to 300Deg. enhancement of IMF and plasma ram pressure. 96150  0900	96150  1330	EyC/PC		W	Strong EyCs and PCs in IMF and plasma observed. 96156  0300	96156  0900	SBC		W/8	phiB changes from approx270 to 90 Degs. southward and GEOTAIL was in the SW.
the SW flow is about 50Km/s southward. 96171  0200	96171  0200	SBC		W/8	phiB changes from 300 to120 Degs. 96236  0240	96236  0515	MISC		W	A flux-rope interval?, ejecta related? 97010  0440	97011  1130	IMC		W/8	Strong disturbances to the Earth's Magnetosphere"
97066  0000	97066  0000	MISC		W	SW speed discontinuty, close to Heliogr. sheet? or near three times normal SW values. 97146  1550	97147  2340	BzS/MISC	W	Region with very low proton beta, Ejecta? 97150  1430	97150  2030	MISC		W	Below average Np and very low proton beta, Ejecta? 97170  0540	97170  2300	BzS		W/8	Region with very low proton beta, Ejecta? 97196  0240	97196  0620	PC/EyC		W/8	Plasma sheath infront of Ejecta candidate? 97196  0620	97197  0515	BzS/MISC	W/8	Region with very low proton beta, Ejecta? IMF above normal, GEOTAIL in the SW.
97265  0130	97265  1730	IMC		W	Expanding magnetic flux rope with approx. half the rotation of a typical IMC. 97274  1140	97275  2310	MISC		W	extended strong IMF, ejecta/IMC? 97286  0002	97286  2100	BzS		W	Period of ion beta much smaller than one. 97288  1640	97288  1700	MISC		W	A gradual SBC? 97295  1830	97295  1830	MISC		W	Possible bow shock crossing (outward), a Quasi// BS? and a large magnetic hole near 0950 UT. 97308  0000	97308  0220	MISC/PC		W/8	Interval showing possible IMF rotat. discont. IMF predominantly South for most of the period. shock (at IMP-8) the IMF rotates from S to N!. double dip observed in the strength of the IMF. 97315  0200	97315  0430	SBC/PC/MISC	W	Multiple SBCs and intervals of IMF holes. halo CME in the East side of the Sun. more during the first eight hours of this event. 97328  0630	97331  2345	SBC		W	Period with multiple SBCs. IMF rotating between 120 and 330 Deg. 98076  1750	98077  0615	MISC		W	Very low beta (protons) region, Ejecta? 98084  1400	98084  1000	MISC		W/8	Interval of very low beta (proton), Ejecta? 98124  1200	98127  2140	MISC		W	Multiple Ejecta(s)? 98135  2345	98136  1130	MISC		W	Region of low beta (protons), Ejecta? GEOTAIL also in the SW.
IMP8 in the SW until 0540 on 98173. 98176  1610	98177  1700	MISC		W	Region of below average proton beta, Ejecta? related to H-CME from Nov. 5, 6? related to H-CME from Nov. 7? 98317  0415			MISC		8	IMC? at approx. 15 UT on May 3. 99177  0220	99177  0220	PC/MISC		W	Also a tangential discontinuity at WIND. 99179  0200	99179  0600	PC/EyC/MISC	W/ACE	Interval with multiple pressure pulses. 99179  0900	99180  0300	MISC		W/ACE	A low beta(proton) region, hence Ejecta? far upstream of its usual location. possibly related to 00UT October 18 Sun H-CME. Ring current index Dst reached below -250 nT near 0700 UT on Oct. 22. 99328  0600	99328  1500	SBC/MISC	W/ACE	Period with multiple SBCs, and one large magnetic hole near 1400 UT. 00051  2100	00051  2100	IS		W	At ACE at 2040 UT. 00055  1408	00060  1940	HSS		W/ACE	Is this the fifth time does it recur with a 27 days period? 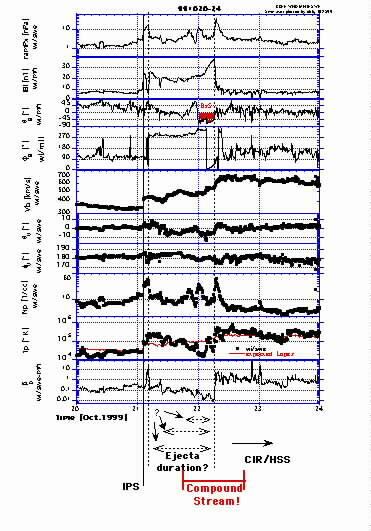 00061  0300	00062  0300	BzS		W/ACE	Average/low density interval with start solar wind speed >500 km/s. Ejecta? 00123  0900	00123  1300	IR/SBC/EyC	W/ACE	Low density interval, and in part very fast (solar wind V>900km/s) Ejecta? 00167  1220	00167  1220	PC		W	A weak reverse fast IS? 00210  1415	00211  0900	MISC		W/ACE	Possibly IMC or ejecta interval, mple flux-ropes? 00223  0510	00223  0510	IS		W	Ahead of ejecta? 00259  1630	00260  1800	MISC/BzS	ACE	IMF lines appear drapped. Sheath region field lines surrounding ejecta? 00263  1600	00263  2200	MISC		ACE	Interval of a magnetic field mostly aligned with the Sun-Earth direction. 00332  0800	00333  0240	MISC		W/ACE	Low proton temperature region, above average solar wind speed, ejecta? 00357  2200	00358  1200	BzS/PC/MISC	W/ACE	Ragged magnetic field and SW structure (3 times average IMF) in LSS, ejecta? 01043  2050	01043  2050	PC		ACE	Possibly fast forward IS, start of IR? 01045  2110	01045  2110	PC		ACE	Possibly a slow reverse IS, end of IR? This server and the information being made available are evolving as the ISTP Project evolves. Questions or comments should be sent to the authors at the address below.